Alyssa Kohler made a promise in June of 2017: one that would ultimately have a profound impact on thousands of South Africans. Promises, though, are easy to make but far more difficult to fulfill, unless you're Alyssa; then, we learned, it is just a matter of time. 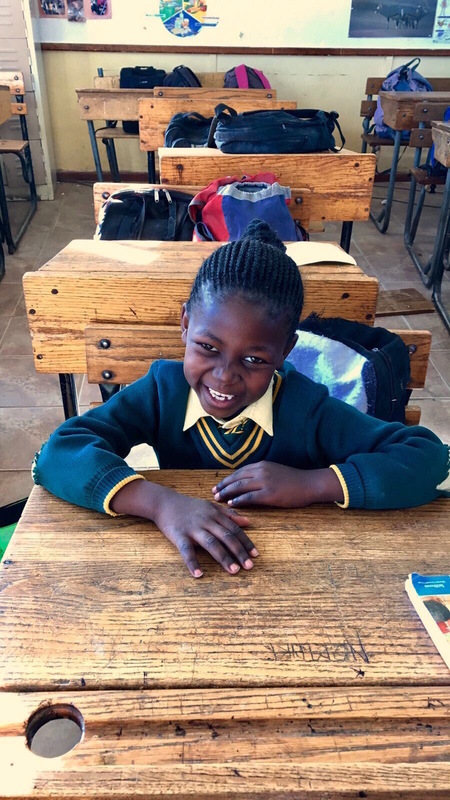 While traveling with a UP volunteer group in Nomathamsanqa, South Africa, Alyssa, alongside local medical personnel, traveled door-to-door in an underserved neighborhood to conduct baseline health examinations, do screenings, counsel, and gather data about residents' health challenges. The participants were grateful and open-hearted as UP became familiar with the breadth of the issues: from diabetes, HIV/AIDS, and TB to dehydration and lack of healthy food. Alyssa, who plans on a future in medicine, understood that a two-week volunteer trip does not make for permanent change, so when the volunteers discussed a way to maintain the momentum inspired by the healthcare initiative, Alyssa was all over it. The vision was to create a pamphlet that contained vital information about health, such as the importance of check-ups and medicine compliance, what constitutes a healthy diet, disease prevention, symptoms, and treatment, the ramifications of drug and alcohol abuse, personal safety, and stress management. The pamphlet would also contain emergency numbers. Great idea. Easier said than done. Unless you're Alyssa. In the midst of a demanding senior year in high school, Alyssa pecked away at this massive project. She did research, consulted, designed, and revised. Once a first full draft was born, UP sent it off to South African medical personnel for their invaluable feedback, which was readily incorporated. UP then secured the services of Siyabulela Rabie, UP's first university graduate. Siya was born and raised in Nomathamsanqa and received his honors degree in Social Work at Nelson Mandela University. He agreed to translate the document from English to Xhosa so that UP, in the spirit of education for all, could make the pamphlet available to every single citizen in Nomathamsanqa via schools and clinics. Overnight, the impact spread from one small neighborhood to an entire community. THAT is sustainability. That meant, though, that we had some serious money to raise to fund the printing, but Alyssa knew that. Already, she had brought in $450 via her school's National Honor Society and organized another fundraiser to secure more donations. Alyssa will get it done. We are not worried.